It’s official. Russia’s population grew by 23,300 souls in 2009, for the first time since 1995. The rate of natural increase remained slightly negative for Russia as a whole, though the Siberian and Urals Federal Regions actually saw positive natural population growth for the first time in 19 years. However, this was more than compensated for by immigration. This improvement was in large part thanks to an impressive increase in the life expectancy, which rose to 69 years in 2009 – almost as high as in 1963-68 (before the alcoholism epidemic) and 1986-91 (Gorbachev’s anti-alcohol campaign). Birth rates also increased by 3%, hysterical Russophobe predictions of a crisis-induced “abortion apocalypse” to the contrary. This of course should come as no great surprise to S/O readers, since back in mid-2008 my projections indicated that Russia will see positive population growth starting from 2010 at the latest. Furthermore, as both Sergey Slobodyan and myself argued, claims that the economic crisis would produce a sharp drop in fertility rates were entirely spurious (instead, the TFR increased to 1.53 children per woman in 2009 from 1.49 in 2008). If anything, the demographic facts on the ground are now actually substantially exceeding Rosstat’s, Slobodyan’s, and my own most optimistic forecasts (not to even mention “pessimists” like Eberstadt, Steyn, etc). 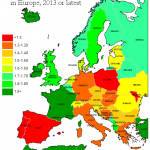 These demographic developments are examined and analyzed in greater detail in the essay by S/O guest blogger Sergey Slobodyan below. Finally, mortality and fertility numbers for December and the whole 2009 year are out, so I could finish my preliminary analysis of last year’s demographic developments in Russia. In December, almost 154 thousand kids were born, which is again more than last year (147 thousand). For the whole of 2009, number of births was 2.9% higher than last year (1,764 thousand vs. 1,714 in 2008, or 12.4 per 1000 vs. 12.1 in 2008). Fertility increases over the last year started to flatten out towards the end of 2009, which is also very clearly shown by my forecasting model. Since September, actual number of births is systematically lower than that predicted, with cumulative deficit of about 15 thousand births since August (August was an extremely successful month but it was forecasted, thus Sep to Dec the deficit is about the same). If I were to trust my model’s forecasting ability, 15 thousand births (relative to the upward trend!) is the demographic cost of the crisis of 2009. Comparing with the predictions of late 2008 – early 2009 (100 to 200 thousand absolute decline in number of births), we see that population held up much better than many professionals expected. Given such a large forecasting error, some serious adjustment of professionals’ models is warranted, and their posteriors should differ from the priors a lot. Let see if this happens. On the mortality front, December saw a continuation of the November tendency – number of deaths was higher than in 2008, 179 thousand in Dec 2009 vs. 176.7 thousand in Dec 2008. Looking into disaggregated data, one can see dramatically higher number of deaths from flu and pneumonia; overall, respiratory system deaths are 25% higher in Dec 2009. Cardiovascular deaths are marginally higher (by 0.5%) in December. Both these classes of deaths showed a 5% overall decline for the whole of 2009, and thus Dec (and Nov) numbers are a large anomaly. A significant portion of the anomaly is clearly caused by the extreme cold weather, and so I expect bad January numbers as well. Relative to forecasts of my model, there were about 7.5 thousand more deaths between Aug and Dec, with 20 thousand in Nov and Dec alone. For the whole of 2009, death rate is 14.2 per 1000 vs. 14.6 a year before. Every forecasting model, especially at a time of quick changes, must pay attention to its predicting ability. That demographically speaking we are in period of fast changes is very easy to establish by comparing consecutive Rosstat demographic projections till 2030 which are available on-line for the last three years. For a reason that will become clear immediately, I concentrate on the ‘High’, or the most optimistic, forecast in every prognosis. In 2007, High variant of the forecast gave the following numbers for natural population change in 2008-09: -632.2 thousand in 2008 and -581.1 thousand in 2009. Forecast created in 2008 gave 333.3 thousand as the best guess for natural decline in 2009. In one year only, Rosstat had to increase its forecast of natural population change by almost quarter million people! Still, it was way too slow: in reality, the population decreased (due to natural reasons) by 362.0 thousand in 2008 and by 249.4 thousand in 2009. Similar misses can be observed in predicted migration as well: 2007 forecast gave migration increases of 205.0 and 232.3 thousand in 2008 and 2009, respectively. 2008 prognosis was higher: 290.4 thousand increase in population due to migration in 2009. And what are the actual numbers? In 2008, 242.1 thousand is the positive balance. Official figures for 2009 are not available yet, but in the first 11 months net international migration gave 227.6 thousand extra Russian inhabitants; one would expect at least 250 thousand for the whole year. Clearly, here Rosstat was quick to learn the lesson and erred on the high side (but remember that I’m talking about High variant which is supposed to err on the upside). How are these errors translated into population numbers? In 2007, the High variant of Rosstat forecast saw Russian population as of Jan 1, 2010 equal to 140878 thousand people; 2008 vintage moved the number to 141807 and 2009 one to 141876 thousand. Preliminary Rosstat’s guess for the actual population as of Jan 1, 2010 is 141927 thousand. This estimate was made in mid-January to provide materials for Golikova’s report on Jan 19, and at least births numbers there were too low. Still, we could compare 141927 to 140878 and see that in just 2.5 years (demographic forecasts are usually made in the middle of a year) the forecasting error was more than a million souls. And we are talking about High variant here: in 2007, the Middle forecast gave Jan 1, 2010 population at 140760 thousand, another 120 thousand error. Clearly, the errors are dramatic. It is also clear what their source is: after some declines, deaths were essentially flat in 2007, and births really started growing only in 2007 after a sideways movement in the previous years. The errors are pretty understandable. Still, you have to keep them in mind when someone tries to hit you on the head with UN population forecast, even its 2008 revision: remember that the Russian data that went into that revision is much older than 2008. 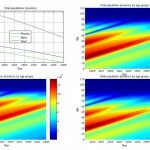 What does my model forecast for 2010? If I fully take into account deterioration of the fertility and mortality situations towards the end of 2009, my forecast for 2010 is about 1800 thousand births (a 2% increase relative to 2009) and 2 million deaths (about 0.7% drop relative to 2009). The model estimated using the data through July 2009 gives 1853 thousand births and 1947 thousand deaths. I believe that a significant portion of the deaths’ uptick is weather-related and will go away; I would therefore expect something like 1960-1980 thousand deaths in 2010, or 13.8-14 per 1000, but 13.7 won’t surprise me either. A decrease in fertility is a clear manifestation of the economic crisis, which turned to the better (at least in popular consciousness) towards Fall 2009. Thus, I’d expect the crisis-related postponed fertility to recover toward the second half of 2010, and so my forecast is for 1820-1840 births next year, or 12.9 per thousand, with any number from 12.7 to 13.1 also quite possible. On Jan 22, vice-premier Aleksander Zhukov said that ‘between 2006 and 2009’, life expectancy at birth has increased by ‘almost 4 years’ to 63 years for men and 69 overall. (For the total population, year 2005 saw life expectancy at birth of 65.3, and thus he probably meant the difference between 2005 and 2009 life expectancies). Usually, this number is calculated towards the middle of the next year, as it requires knowing exact age-specific death rates. However, a quick check of this number is definitely possible. For the last several years, there was a solid linear relation between changes in the death rates and changes in life expectancy at birth: for males, a decrease of the death rate by 1.0 is translated into increase of life expectancy at birth by 1.34 years. (2008 was an exception, with an increase of life expectancy for males by 0.4 years while the death rate remained essentially the same. This happened because infant mortality and mortality in younger cohorts continued to improve strongly. Age-specific death rates actually increased among some older cohorts, such as the 55-59, 65-69, and 80-84 groups, but these contribute very little to the life expectancy at birth formula. Barring such shifts in mortality, the linear relation holds). By plugging in 2009 numbers, we get 0.57 years increase, or 62.4 years life expectancy at birth for males. With a little help from further favorable age structure changes (such as less deaths in the first year or twenties), this could easily go above 62.5 and be rounded up to 63. Of course, life expectancy at birth increasing at a close to double digit number of month per year is nothing short of remarkable – as remarkable, in fact, as its breathtaking drop between 1990 (63.73 for males and 69.19 overall) and 1995 (58.12 for males and 64.52 overall). So, in a certain sense, the last several years are nothing but the early 1990’s playing out in reverse. More surprises on the upside in demographic data. Vice-premier Zhukov has announced yesterday that life expectancy increased by 1.2 years (as reported by Russia Today) or 14 months (see Nezavisimaya Gazeta) in 2009. This clearly shows that in 2009 favorable changes in age structure of mortality continued apace. 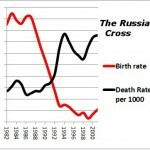 I have no note that in Russian context even 1.2 years increase of life expectancy at birth in a single year is not unheard of – it increased by 1.3 years in 2006. Still, life expectancy for both men and women is still marginally lower than it was back in 1990 (69.13). Two decades lost. Nezavisimaya Gazeta [AK: A Russian liberal paper] is trying very hard to put a negative spin on the news, but doesn’t quite succeed. The only angle they could find was to say that the government might try increasing pensionable age, as deputy head of Ministry of Economic Development Voronin mentioned life expectancy sustained increase over 70 years as a point where discussions could start. It is hard to find a pension system expert who wouldn’t argue for such an increase, but the issue has been a politically risky one. With life expectancy overall moving above 70, and for men above 65, the danger of populist rhetoric recedes.